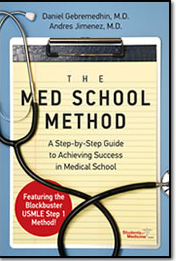 T he Med School Method Book provides guidance to help you every step of the way through medical school and into your top choice residency program. Unlike other books that focus just on the Match or the Boards, this book covers that and much more. This book will help you develop a high-yield and effective study style during the first two years of medical school. This style will prepare you effectively for the USMLE Step 1 Boards. The book then transitions into the clinical years and details how you can succeed at your institution as well as how you can perform at “away” electives. Other topics include research, the Step 2 exam, and creating your rank list. And of course, the book contains the Step 1 Method, the ultimate preparation guide for the Step 1 Boards.